I had high expectations entering Laos, mostly because my friend David had told me that Luang Prabang was possibly his favorite destination ever, and boy oh boy were those expectations met. Wandering the streets of Luang Prabang, the formal royal capital of Laos, transports you back to another time. 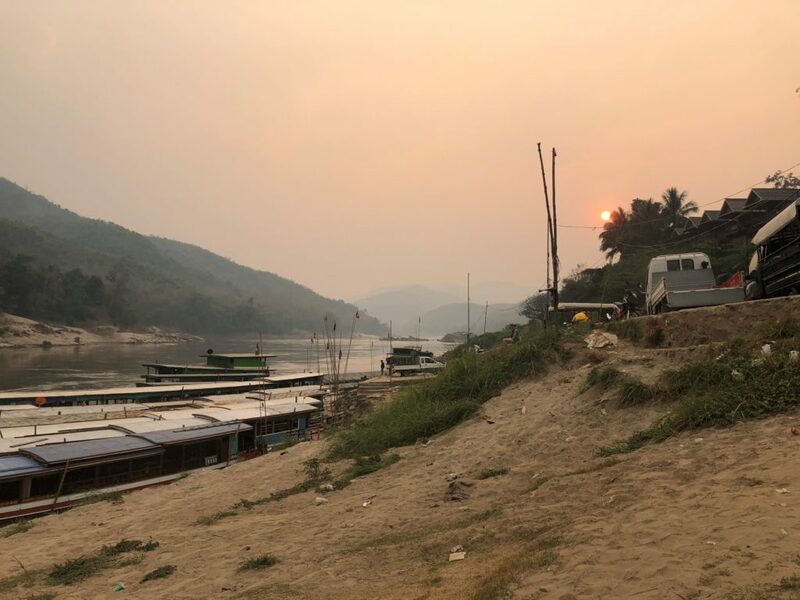 No loud hum of electricity or pulsing night clubs along the main street, just the crows of roosters and the sun slowly arching from the NamKhan River at dawn to the Mekong at dusk. Since arriving on Tuesday I’ve felt like the sand slowly falling through an hour glass, and I’m definitely sad my hour will be up tonight. 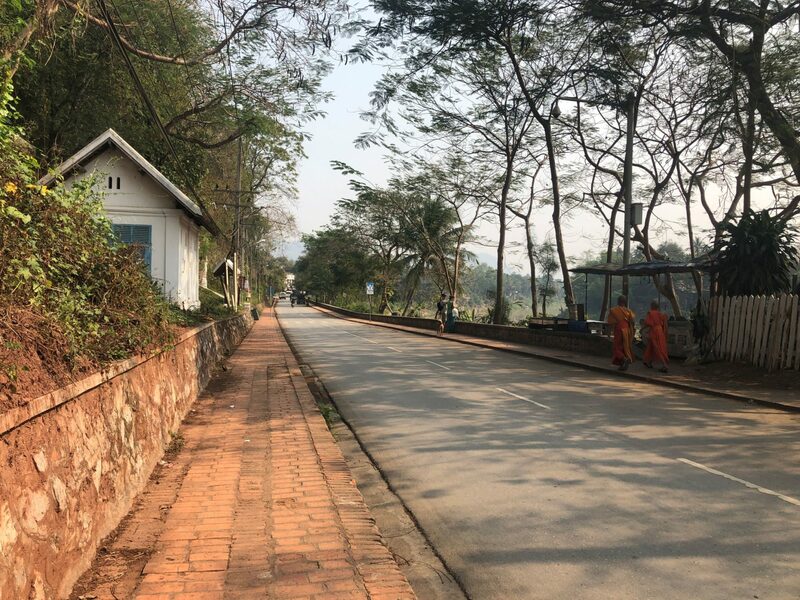 Spotted two novice monks while enjoying my first run in Laos. Apparently all Laotian boys are supposed to be novice monks for at least three months, when they come to the cities and live in monasteries to attend school and learn the Buddhist monk ways. 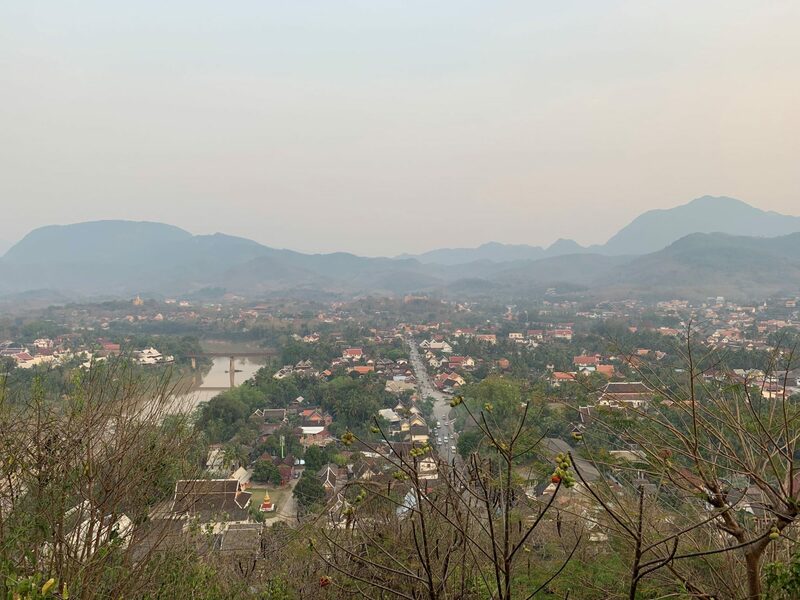 To arrive in Luang Prabang we crossed the border into Laos from Chiang Khong, Thailand to Huay Xai, Laos, where we successfully bought our Laos visas with US Dollars. (Yes, you heard that correctly. 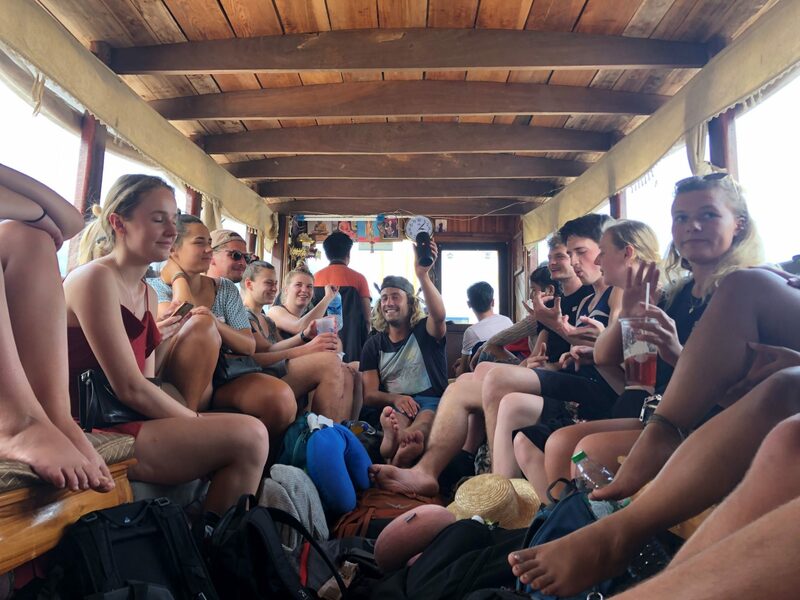 While you could pay in Thai Baht and Lao Kip as well, they give a discount if using US Dollars…) After crossing the Friendship Bridge by tuk tuk we boarded our slow boat for our first of two long days gliding along the Mekong. We were packed like sardines the first day, often opting to sit on the floor with our luggage to maximize what little space we had. Even so, the six hours went by smoothly, filled with interesting chats with fellow young backpackers, group singing of Bohemian Rhapsody, and many occasions of barking every time this adorable local brother and sister poked my nose (you had to be there). We befriended three of the four children in this family (to be fair to the fourth, he was only months old in his mother’s arms, so he didn’t really have a chance to strike up conversation with us). We arrived in Pak Beng for a stopover before finishing the journey to Luang Prabang the following day. 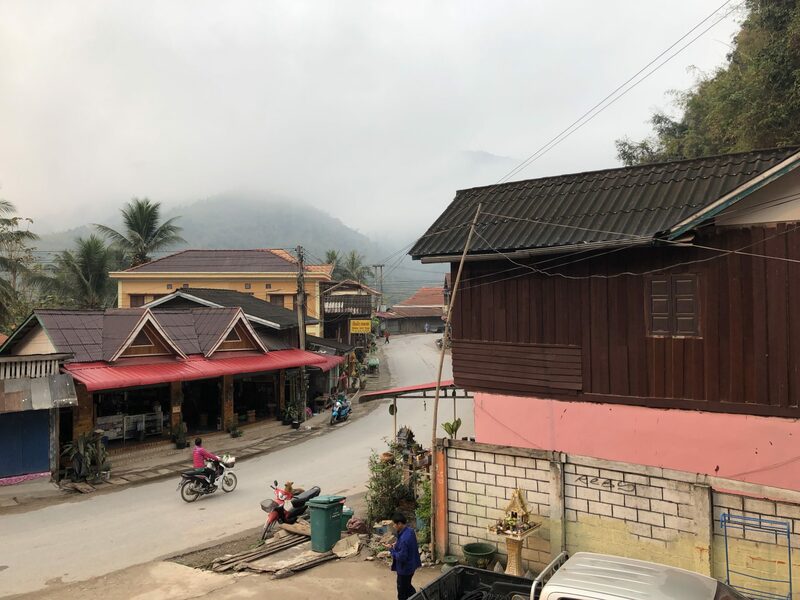 It wouldn’t surprise me if there are just a couple hundred people living in the village (if that), but it was a perfect palette cleanser for leaving the bustle of Thailand and entering the calm of Laos. During a short stroll up the main street of town before a delicious dinner (the coconut fish curry with sticky rice was perfect), I marveled at the near darkness, the streets only lit with the faint light emanating from the concrete homes along the side. 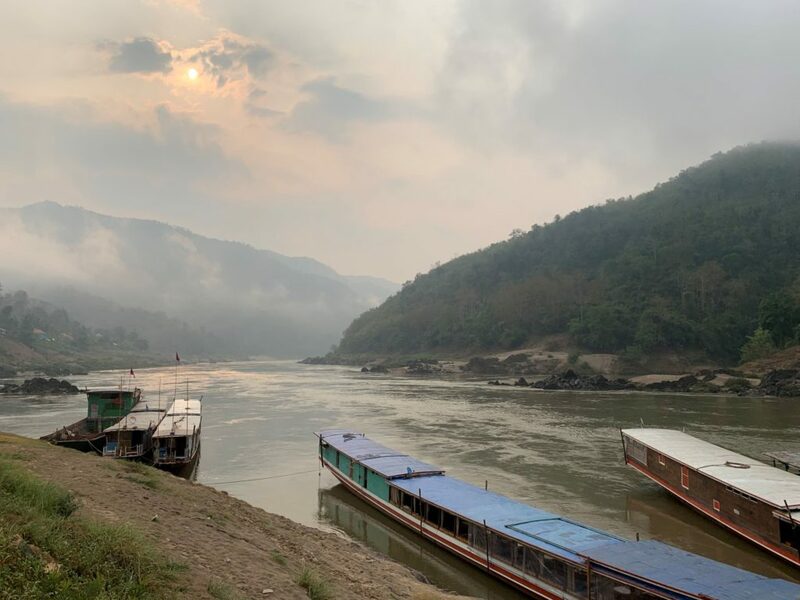 By the time we arrived at Luang Prabang we were happy to stretch our legs after seven and a half hours on the boat and sufficiently chilled out to fit right into the town’s vibe. 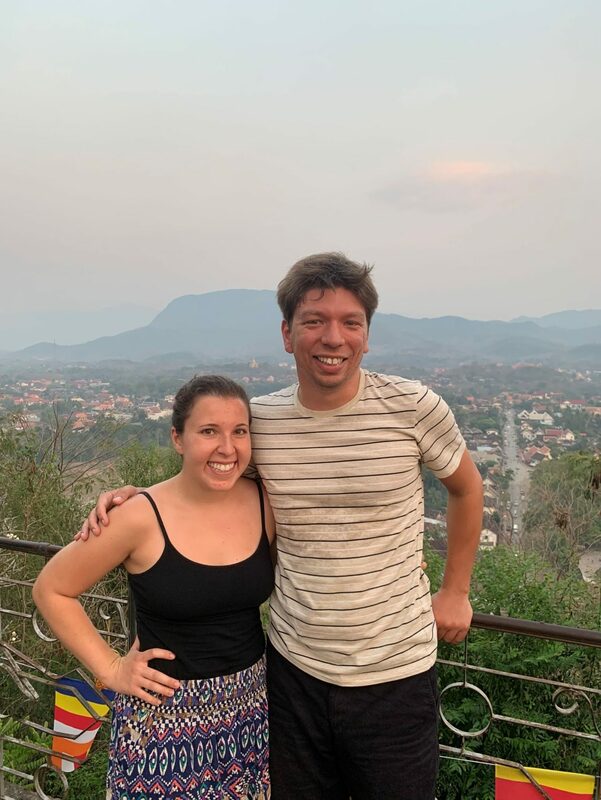 After meeting our wonderful Airbnb host, Sophie (originally from the UK but living in Laos for the past four years and possibly harboring the best travel stories I’ve heard to date), we headed out for a walk through the night market and our first of two dinners at Bouang. 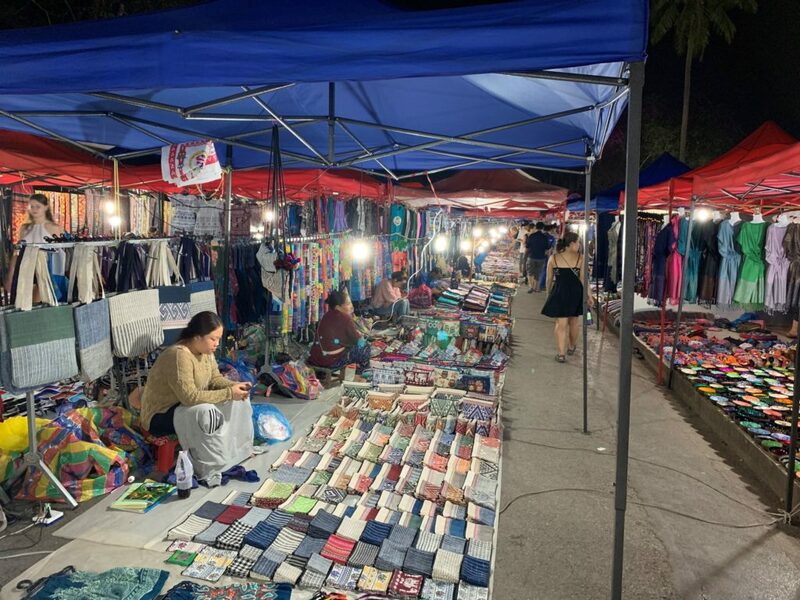 Originally started by a local who became enthralled with Paris’ many street markets after visiting the French city, the night market fills the main street of Luang Prabang every evening. 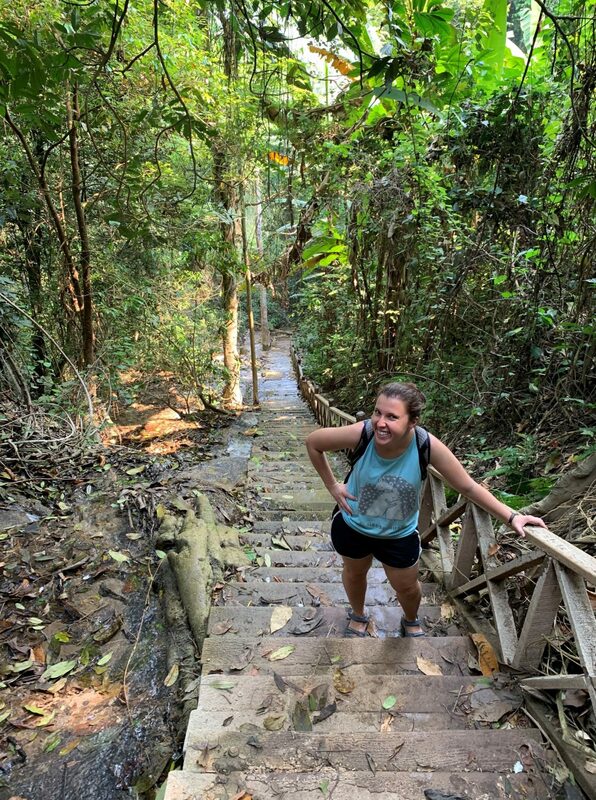 Unlike the other markets we’ve experienced in Southeast Asia, this one was actually enjoyable to walk through, not just because there were fewer people around which to maneuver but also because everyone was just a lot more pleasant. The next morning I embarked on my first of two runs around town. Although the sidewalks are sporadic, there are few cars and motorbikes on the street, rendering my biggest enemy the smoke in the sky. 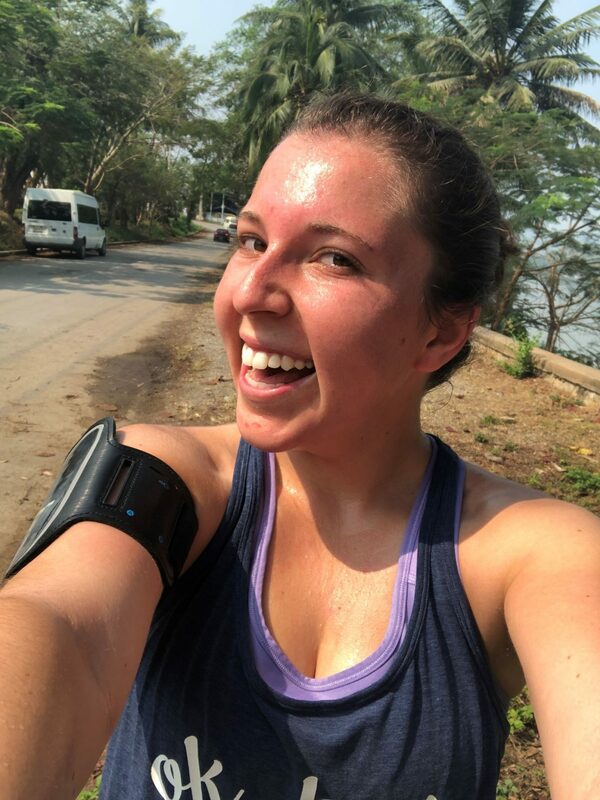 Even with the excess coughing, it was a beautiful run along both the Mekong and NamKhan rivers and it never fails to amaze me when I think about just how many countries I’ve gotten to run through. 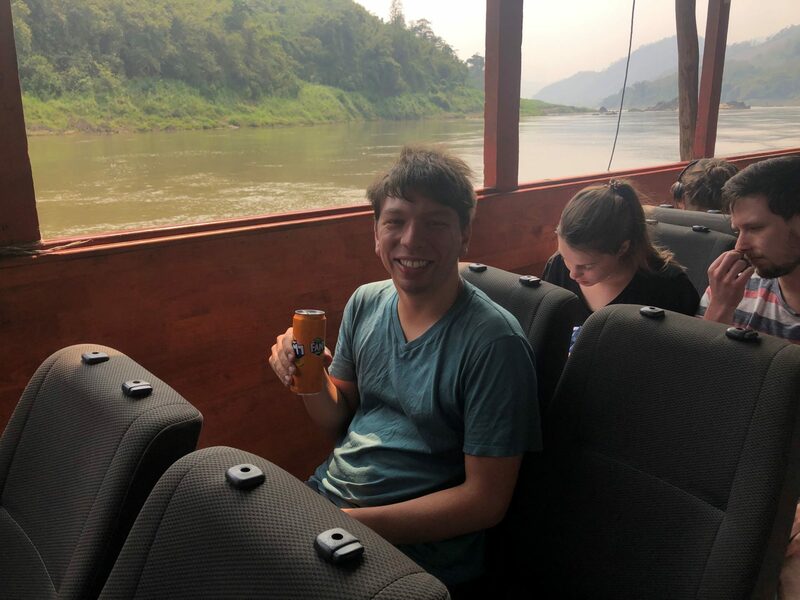 After cleaning myself up, Dom and I headed out for a stroll along the Mekong before lunch with possibly the most relaxed setting we’ve experienced to-date. 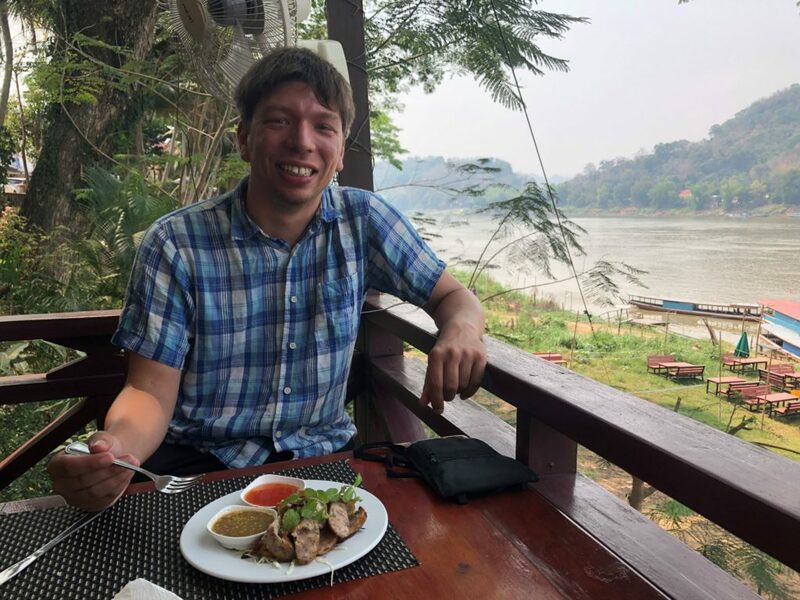 Perched along the banks of the Mekong, I enjoyed my green curry while hearing the water lap on the banks below and the roosters crow from next door. 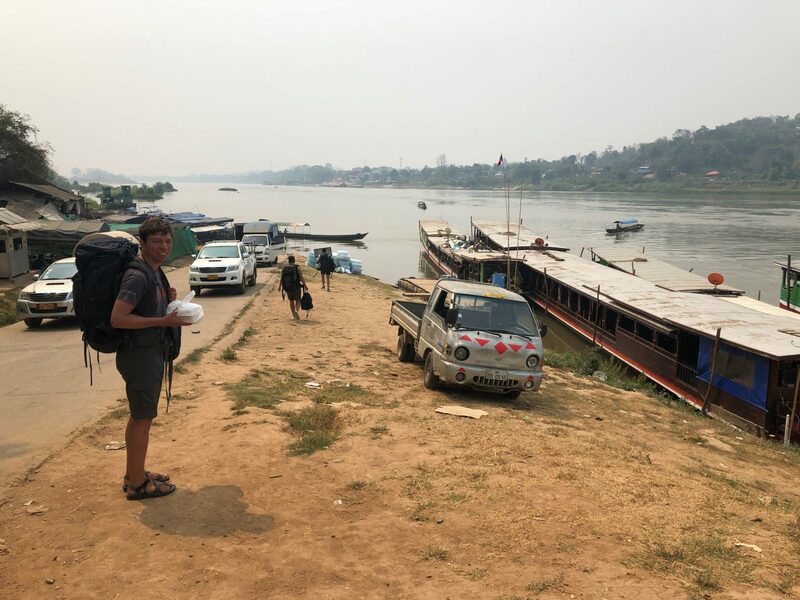 We then continued our stroll, mimicking my running path so I could fully enjoy the confluence of the Mekong and NamKhan rivers (and take proper photos, of course). 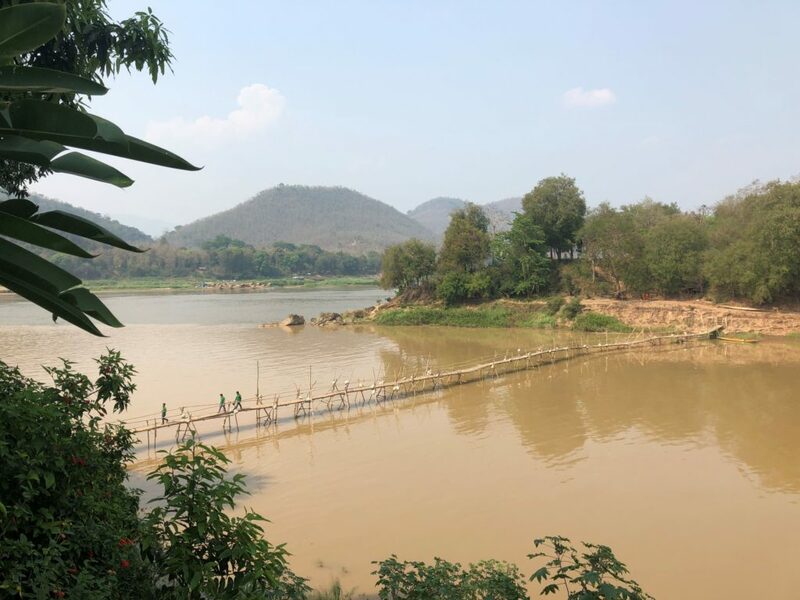 This bamboo bridge is one of two that stretch over the NamKhan river during dry season. During the rainy season the water level is too high so they take down the bridges. 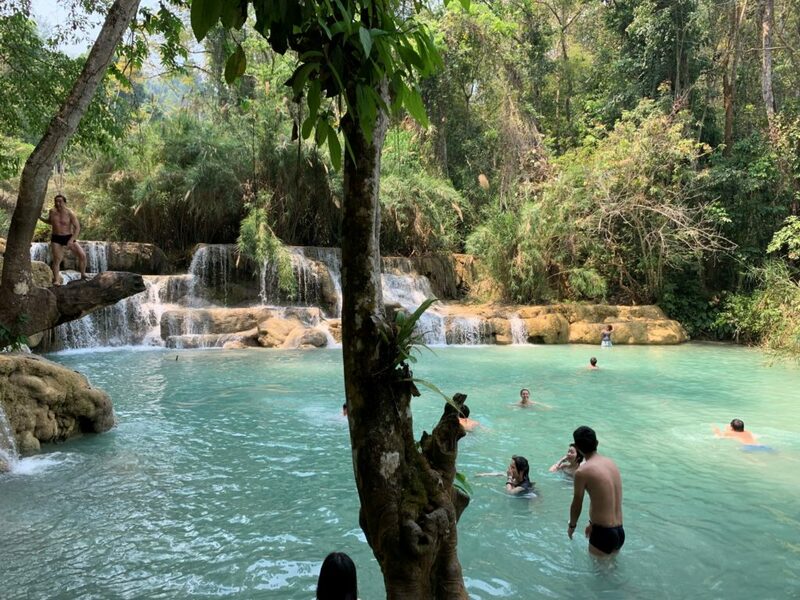 The next day we headed 45 minutes out of town to Kuang Xi Falls, the number one tourist attraction in Luang Prabang. 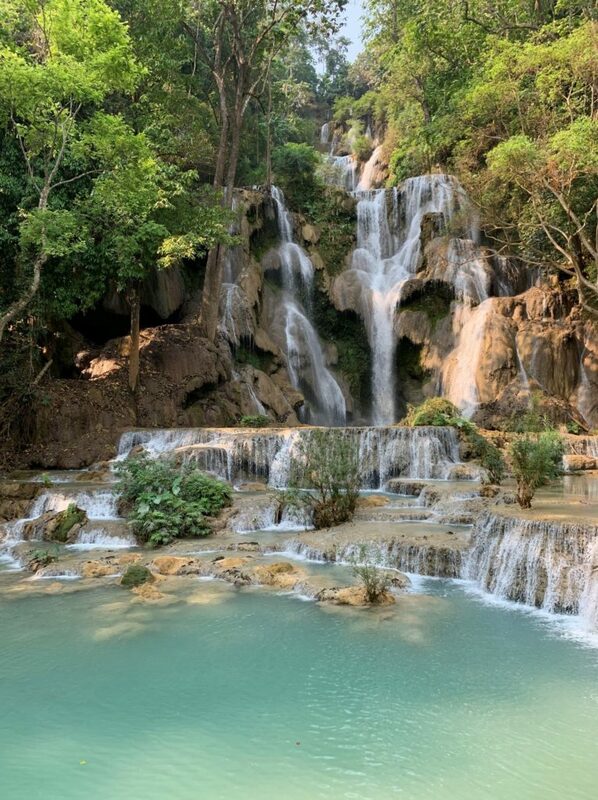 These waterfalls cascade down the hills and occasionally the water pools into aquamarine swimming holes. 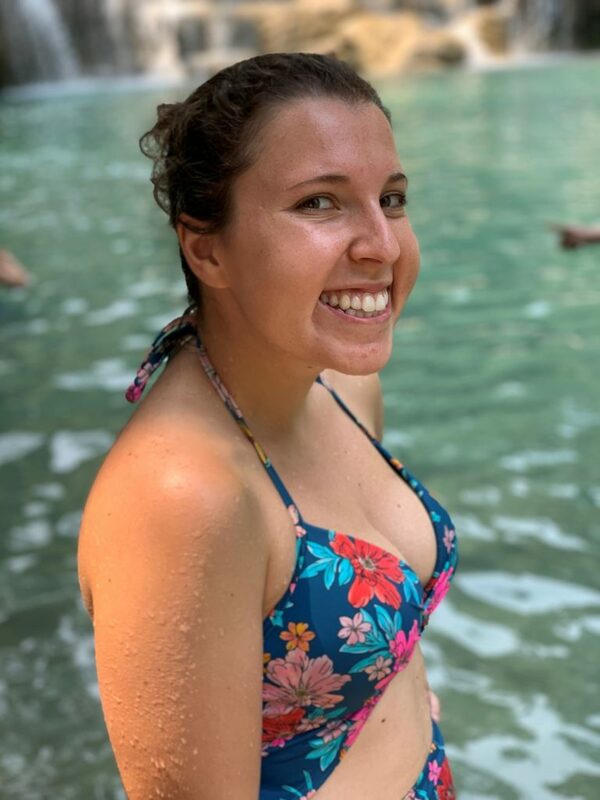 After a slippery and sweaty summit to the top of the falls, we enjoyed cooling off in the swimming areas before heading back into town. For dinner we headed to another riverside restaurant, this time boasting some of the best fish I’ve ever eaten (and given Dom’s eagerness to keep sneaking a bite or two off my plate, I imagine he feels similarly). 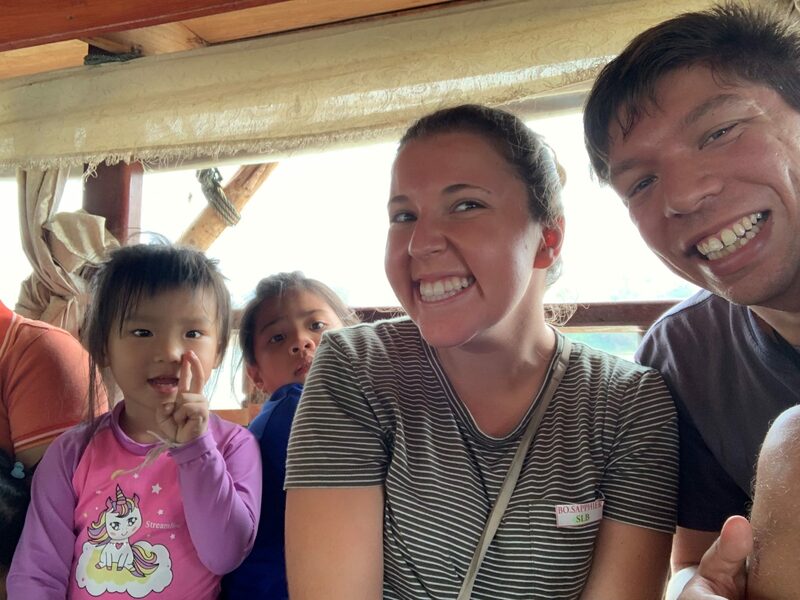 I’ve always been a fan of waterside dining, and our meals along the Mekong and NamKhan may top my list when it comes to the setting. I don’t know how to properly convey just how beautiful it is to sit above these rivers–so calm with just a few lights glowing across their banks. I never wanted to leave, but the thought of munching on some coconut pancakes from the night market on our walk home helped move me along. 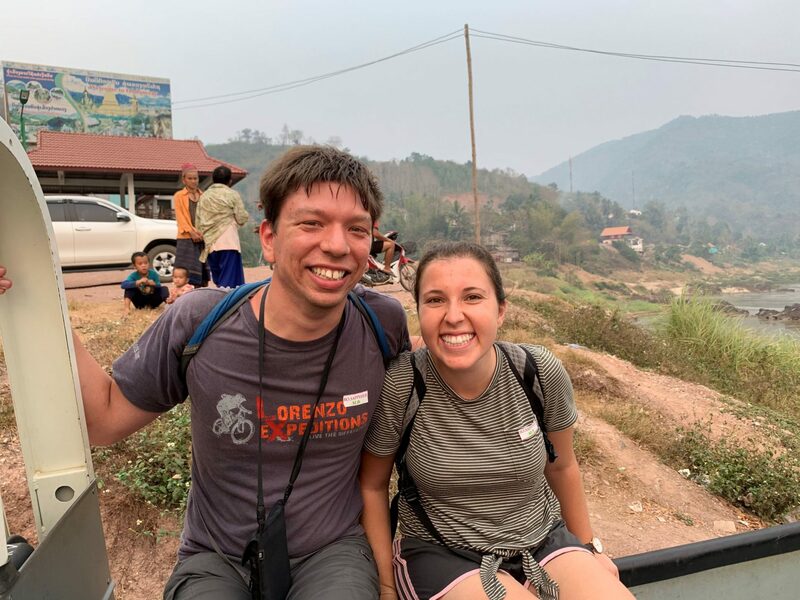 This morning I went on my second run in Laos, and since then Dom and I have been lounging around writing our blogs, playing with Felix the cat. 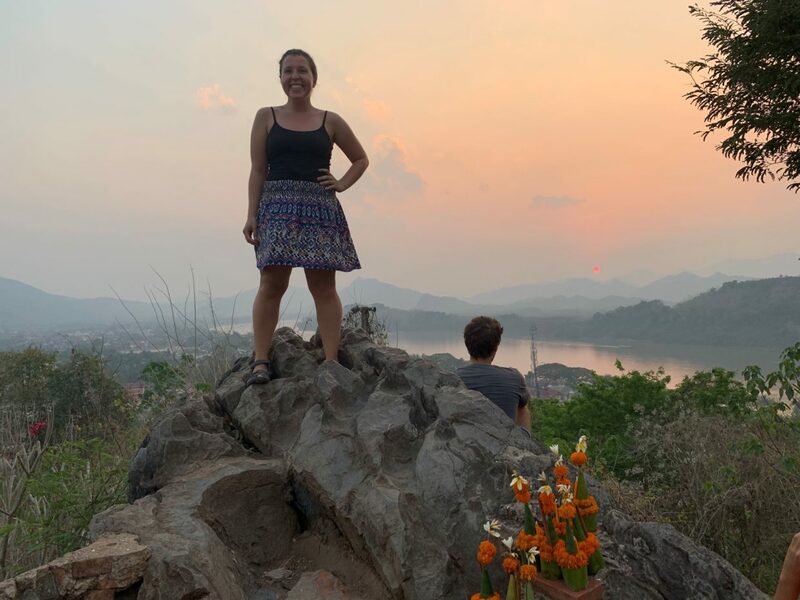 After our final lunch along the Mekong (yes, we’re creatures of habit and repeat our travel restaurants often), we hop on a short flight to Hanoi to begin exploring our penultimate country. 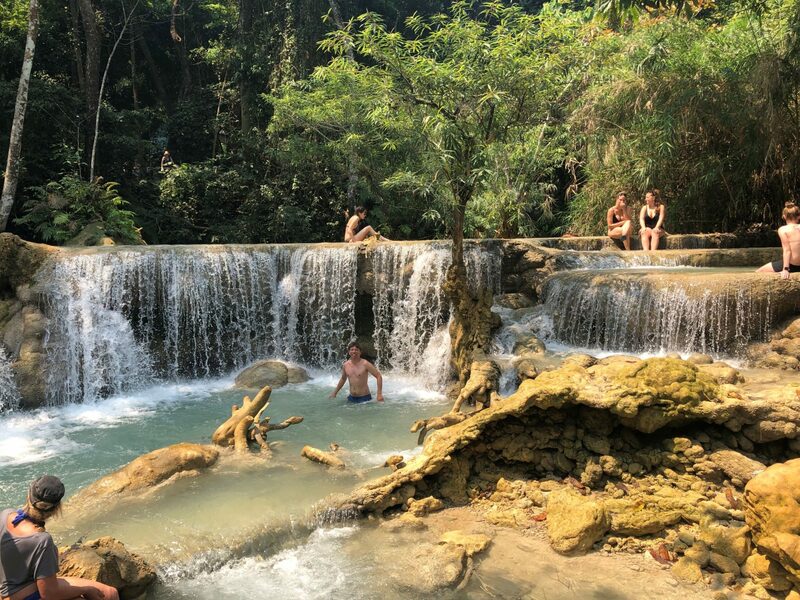 If you ever do make it to this part of the world, please come to Luang Prabang. You won’t regret it.